The chocolate, cheese and mountains are all great reasons to visit Switzerland, but my reason for making the journey was to meet two Frenchmen. Aigle is where Volodalen set up its Sportlab which, through a clever mix of knowledge and technology, meets the needs of athletes and sports professionals. I walk into the centre, which occupies the ground floor of a small building, and enter a light and welcoming room. On the left there are exercise bikes and a weightlifting bench, in front of me a treadmill and everywhere there are our old friends, Qualisys cameras. Everything is neat and tidy and you can sense the attention to detail: from towels embroidered with the colours on the walls, even down to the shoes worn by Cyrille Gindre who welcomes me. 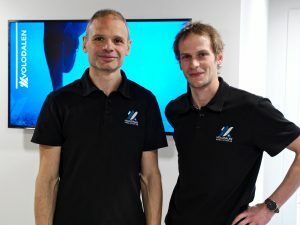 Cyrille is the founder of Volodalen and also a doctor of biomechanics who has written several weighty tomes on running. 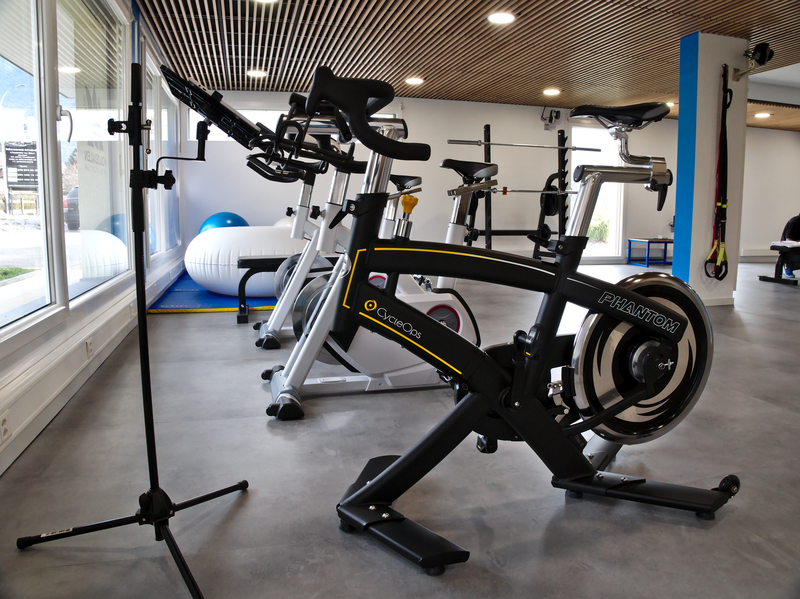 Volodalen organises trials, coaching and exertion tests, trains athletes and carries out research and development in the field of movement sciences, among other things. Here you can learn to understand yourself in terms of mobility. The Qualisys system put in place by Trinoma enables movement to be analysed to work out each person’s motor habits. Cyrille explains to me that studying how a person runs links in with many everyday movements, such as how you pick up an object. There are two types of runners, aerial and terrestrial, both of which have their own advantages and disadvantages. He also stresses that there is no single ‘right way’ to do things, but rather several, which I will come back to later. Thibault Lussiana, also a doctor of biomechanics, takes over to discuss the practical side. A test starts by placing 35 markers at strategic points on the body. They will then be caught by eight cameras that will then transmit a 3D view of the movement onto the screen in front of the treadmill. At the same time, lots of data is collected to make a number of different calculations, including vertical oscillation or the horizontal movement of the elbow. Recording an athlete’s movement means that their stride can be analysed, alongside other tests that are performed to obtain information such as VO2 max or MAS. So after just one short spell on the treadmill, everyone can leave with a huge volume of information enabling them to understand themselves in greater detail. Once your motor ‘signature’ has been obtained in this manner, you receive tailored advice in line with your objectives and the type of sport you do. I found this particularly fascinating. It wasn’t a question of saying ‘do it like this and no other way’ or starting from the beginning again. For people who have a coach, this objective data collected by the Qualisys system is compared with the coach’s subjective view. The resulting discussion leads to the creation of adapted and innovative training. Moreover, this isn’t just limited to running. It can be applied to all kinds of sporting disciplines such as golf, cycling and football. Volodalen was able to count on Trinoma from the beginning of the project. The equipment was set up geared towards the constraints of the activity, and this, combined with the support provided throughout its use, enables movement to be easily quantified. This system can therefore, thanks to Cyrille and Thibault’s know-how, provide athletes with a roadmap to improving their abilities.